The Ultimate RMX Loop Collection - Now For Download! ReMiX Complete Styles Edition contains 19 individual RMX Style Paks (plus a bonus Deluxe Bass Lines RMX Pak). 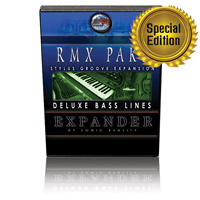 ReMiX Complete Styles Edition offers one of the most flexible and comprehensive loop libraries for Stylus RMX ever assembled. By getting the Complete Styles Edition you save BIG BUCKS! With each of the 20 titles normal list price at $39, the value of this package is $780!!!! Now you can get it for less than half that price. If you want ALL styles for the best price then go for the ReMiX Complete Styles Bundle of RMX paks for Stylus! • More diverse collections by style than any other RMX paks, including rare genres that no other libraries cover. • High quality studio recordings of drums and other instruments for a wide range of professional sounds right out of the box! • Expert slicing and programming making loops easy to work with inside Stylus RMX! Over 700 Bass Line Loops covering a wide variety of styles such as hip hop, electronic, pop, rock, hard rock, jazz and more! This title is a Special Edition Style Pak previously unavailable! It includes hundreds of fresh new bass riffs! Add some BIG BOTTOM to your tracks and experiment with a variety of useful bass parts to use in your music. Jazz Grooves - includes acoustic Jazz drum rhythms with Swing ride beats, brush grooves, Big Band drumming and more, performed by drummers (like Danny Gottlieb) who have played with Jazz legends such as Pat Metheny, Herbie Hancock, Chick Corea and more..
Chi Town Hip Hop - Chicago’s finest producers are emulated in this tribute to the Windy City. Complete with auto-tuned vocals and crisp production, Chi Town Hip Hop is as relevant to mainstream music as it is timeless. Hard Rock - features 305MB of Hard Rock sounds along with 206 Heavy Hard Rocking loops! This R.A.W Style Pak contains 16 construction kits from SR's Hard Rock, Heavy Metal, and Rock Guitar Libraries providing the professional artist with the essentials to create Hard rock Hits! House - features over 450 loops that will instantly transport you to the club! These 19 construction kits contain everything needed to create authentic house music: drums, basses, synths, and more! Miami Club - features 375 loops that will instantly transport you to South Beach. Nine construction kits comprised of drums, basses, synths, and FX have been masterfully performed and recorded, making Miami Club an essential loop workstation from Sonic Reality! Modern Hip Hop 1 - features 480 loops from Sonic Reality's Rap, Modern Dance Rap, and Dirty South 2 libraries! These seventeen high-quality construction kits are made up of drums, bass and synth lines, vocals and FX, and more. Modern Hip Hop 2 - features 470 bangin hip hop loops! Exquisitely recorded drums, basses, synths, vocals, and more make up 25 construction kits, providing the professional hip hop artist with the essentials needed to create hits. Old Skool Hip Hop - Old Skool Hip Hop runs the spectrum of the infamous 80's NY rap scene. With sampler sounding drums kicking over deep basslines in hypnotizing patterns and breakdance joints that will make you want to move your shell toes. Reggae - Be transported to Jamaica with Sonic Reality's Reggae loop collection! Nearly 400 loops make up 13 construction kits of drums, basses, guitars, organs, and everything else you need to create authentic reggae music. Reggaeton - Create authentic Reggaeton beats with this collection of over 150 high-quality loops! Four construction kits made up of bass, drums, guitars, keys, FX, and even vocals provide essentials for hot Reggaeton production. *You must own Spectrasonics Stylus RMX to use this product.